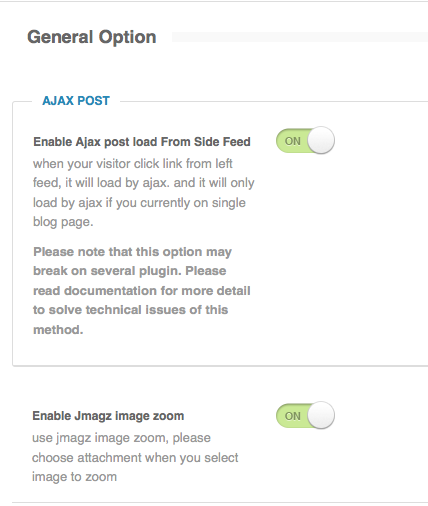 From Jmagz Dashboard→General Option, you have option to enable / disable Ajax Post Load and enable / disable Jmagz image zoom feature. Ajax Page Load : on demo you notice if you currently reading a post / review and clicking sidefeed, page loaded using ajax. All the content will load, not forgetting your Ad (either you using google ads or other ads) or google analytic. This feature is very convenience for reading experience. Enable Jmagz image zoom : we also provide build in Zoom feature for your image that attached into post / review / page. Just simply enable this option so your image will using our build in zoom feature. you can also install another image zoom plugin, but please remember disable this option first.